WELCOME TO MUGBERIA GANGADHAR MAHAVIDYALAYA CENTRAL LIBRARY! From the very beginning, during the year of establishment in 1964 library is a part and parcel of the college. So it has glorious heritage for past 50 years. Like any other Higher Education Institute, we are presently adopting ‘Learner Centric Education’ for catering education more meaningful to students. In this context library plays a vital role in the total education system. The college has a separate two storied well equipped central library covering above 5,000 sq. ft. floor area. It has a large Reading Room for library users. Beside central library the college has a number of departmental libraries in Physics, Chemistry, Mathematics, Nutrition, Geography, Music, B.P.Ed & M.P.Ed, etc. Central library has more than 30,000 books covering Text Books, Reference Books, various types of Dictionaries, Encyclopedias, Year Books etc. Journals and other teaching materials like maps, atlas, and a number of AV materials. Two third portions of books, out of 30,000 books, are entered in our electronic database. Huge number of E-Books and E-Journals can be accessible through the INFLIBNET N-LIST programme of UGC. Regular UG and PG students of the college (about 3000 in no’s), Teachers, Staffs, Ex students and Outsiders are the users of the central library. Advancement of ICT brings a paradigm shift in our regular library works. 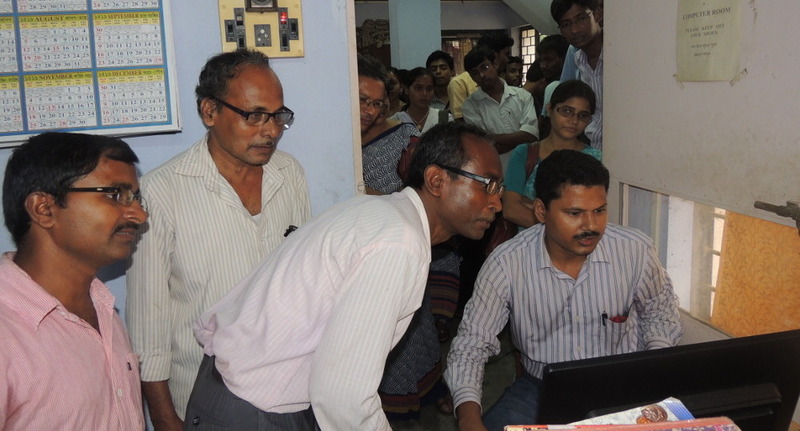 To keep pace with the changing environment we also shifted to automation of library. For this purpose we procure the latest state of the art library management software, SOUL 2.0 (Network Version, Full Edition) designed and developed by INFLIBNET Centre, Ahmedabad, an autonomous Inter University Centre of UGC. With the help of this software we are doing our regular library works like Circulation (Barcode based), Cataloguing, Database Search (OPAC), etc. For this purpose we have adequate number of computers with internet connection, scanners, printers. Broadband facility for Internet connection is available through NME-ICT project of UGC. Users can search the database of the central library through Card Catalogue and OPAC (Online Public Access Catalogue) facility for searching electronic database of the central library through SOUL 2.0 Software. The library follows Dewey Decimal Classification Scheme (DDC 19th. Ed, & 22nd. Ed.) for classifying books. This is the most widely accepted classification schemes in which universe of subjects are arranged decimally and can easily understand and remembered by the user. On the other hand we follow Anglo-American Cataloguing Rules 2nd. Revised edition, 1988 (AACR-II, Rev. Ed,1988) to catalogue our new collection. Central library offers various services to its users. They are – 1) Lending Service, 2) Reference Service, 3) Reprographic Service, 4) Current Awareness Service 5) Display of New Arrivals (Books and Journals), 6) Display of Newspapers and Journals, 7) Display of materials related to career advancement of students. All students are entitled to borrow books from the book bank section of the central library on long term basis. They may return the book before the actual date of return. Central library follows two types of access patterns – 1) Open Access for Teachers & Staffs, and 2) Closed Access for Students and Outsiders. Central library remains open from Monday to Saturday from 10 AM to 5 PM. Lending and other services are open during this time period maintaining a schedule for students. Central library follows a set of library rules & regulations approved by the library sub committe and Governing Body of the College. 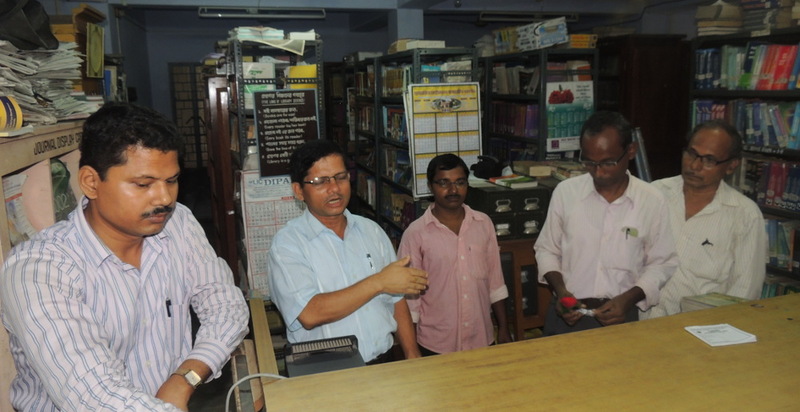 As per the guideline of the Vidyasagar University, for smooth running of library activity, the Governing Body of the College has formed a library sub-committee for the library headed by the Principal and Librarian. Teachers from different departments, Non-teaching staffs and student representative becomes the members of the sub-committee. By the year 2018, prior to 3rd. Cycle of NAAC assessment of the college, we are trying to introduce WEB OPAC System for 365 days x 24 hours electronic database search, Open Access System for all, Electronic Surveillance System (CCTV), WiFi enabled Central Library, Upgraded Reading Room, Additional Computer Terminal for students. Central library & other departmental libraries are also renovated by utilizing the fund of RUSA, UGC, State Govt. and other funds. By the year 2020 if other conditions become favourable we will develop our own digitized institutional repository to go one step forward towards a digitized central library.